Save up to 20%, gain flexibility, avoid sell-outs, and make sure you never miss a show when you become a season subscriber. With full, partial, and choose-your-own package options, there's never been a better time to subscribe. Subscribers receive numerous benefits, including free ticket exchanges, exclusive content and event invitations, and the ability to buy additional tickets at a discounted price. Season packages start at just $111, and it's easy to buy them online. You can also call our box office at 952-563-8575, or stop by in person. We'd love to talk with you about our shows and answer your questions! 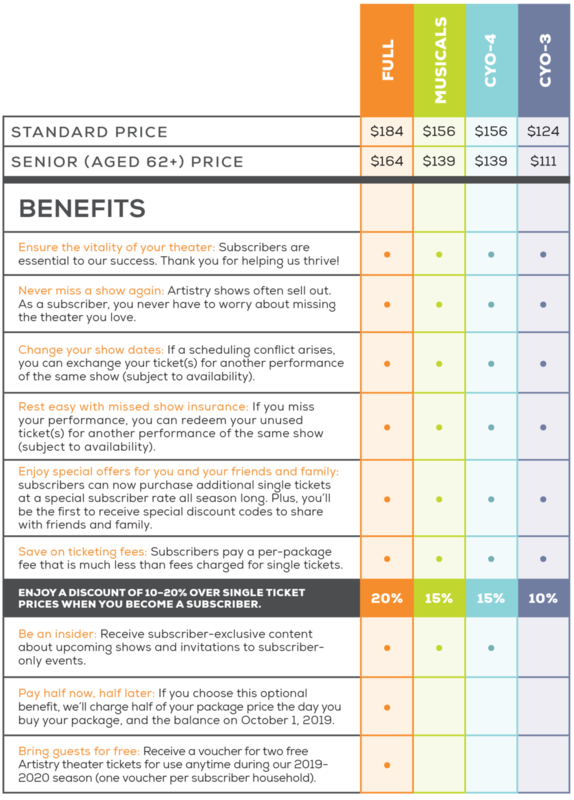 See a full list of season package options, prices, and subscriber benefits below. 2019-2020 Season Packages go on sale for renewing subscribers on MARCH 30. New subscribers can purchase starting MAY 13. Click here to download the how-to guide for online season package orders! Full Package: Includes one ticket to each of the five shows in our 2018-2019 season. Musicals Package: Includes one ticket to each of our four musicals: Footloose, A New Brain, The Bridges of Madison County, and Mame. CYO (Choose-your-own) packages: Create your own custom subscription by picking one ticket to any three shows for a CYO-3 Package or any four shows for a CYO-4 Package.